thanks for all the positive comments, and im glad people have found the car's history interesting. it is difficult to look at the daytona as anything other than what it originally was; our everyday family car, which just happened to hang around for a while. larry recalling it being a grocery-getter just adds to the history. i literally grew up with this car always being a part of the family, and i'd like to believe i would feel the same way about it, had it been a four-door coronet. it certainly has never been looked upon for its potential value, and as the photos show, it is far from being a wise investment, if profitability was the only consideration. my favorite part of this thread is the personal recollection of our car by danny and larry. ironically, both of them have a far more compelling aero car history to tell than i do. a few people here have likely figured out who "69 daytona" is. it has been a thrill seeing his musclecar stable evolve over the years. from the daytona seen above, to the first hemi challenger ever built, along with the t/a challengers, prowlers, vipers, srt challengers, daytonas, and, yes, even some incredible GM muscle. there was never a weak link in the chain, but none of the cars will ever come close to my personal memories of when he had that f6 beauty out for a evening cruise around town. pix...my first T/A, 1985...wearin' my "Jams"
The current owner of this car is a member on the site (Davtona), and it sat next to my car for about 20 years in Dave's garage. VERY cool thread, love the stories from "back in the day"
is the r4 from cadiz that you mentioned the same car that is currently owned by bruce c., in knightstown? 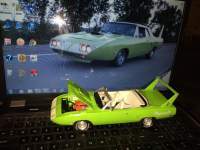 if so, danny (69_500) can add some insight to that particular daytona. i could be wrong, but didn't the yellow bird that was in the smoky mountain musuem also belong to john d., at some point? I'm guessing he is refering to the R4 red Daytona my dad had when he lived in Cadiz. Since its so tiny of a town I can't imagine anyone else there having one. Oddly enough it is close in VIN to the others in this thread. 409045.
that is my guess, too. the vin # thing is amazing. danny, say hello to mr. bell (if you didn't already realize who he was). larry, i imagine you have met danny, or at least his dad, at a bill's diner show back when you had the f6 car. i remember him having a charger 500 at one of them, along with your daytona. ...no idea about a Yelo Bird of John D.
but none of the cars will ever come close to my personal memories of when he had that f6 beauty out for a evening cruise around town. your mention of newby-paul chrysler plymouth reminded me of something dad told me a while back. i dont personally recall it, but dad said his buddy joe huddelston (later of don & joe's repair) used to work at newby-paul as a mechanic. 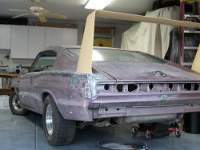 just a year or two ago, joe told dad that the dealership had ordered a replacement nose cone for the daytona, without dad even knowing it. this is pure speculation on my part, but my grandfather had bought his 1973 fury from them, and i cant help but wonder if he didnt mention to them about the daytona being wrecked. i believe newby-paul had worked on the daytona before, and may have just assumed that dad would bring it there to replace the nose. 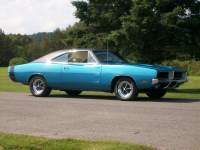 dad didnt want to file an insurance claim on it back then, out of fear of having the policy cancelled, which is why it ended up with a charger front end. dad was dumbfounded when joe told him about the nose cone after all these years. it is amazing that nothing was ever mentioned of it over the years, and one has to wonder what ever became of it. Wow, a plethora of Dodges in there !!! i see that you had two cars at the show. did you walk up the hill to get the second one? the contrast between the vintage and modern hotrods makes for a great look. that's not even the fast one, is it? i see that you had two cars at the show. the contrast between the vintage and modern hotrods makes for a great look. that's not even the fast one, is it? the black one is a series 4 with about 600 hp, isn't it? i dont know if i ever saw the specs on series 3.
by the way, would you consider adopting a 46 year old? Larry the more you keep typing the more I think I should make a trip up to NC. I havne't even been in that town in about 3 years now.